It's that time of year when clementines are in season. I love these little cuties just as they are but they make a perfect snack or a quick dessert. 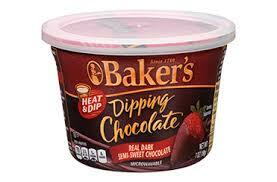 I use a container of Baker's Dipping *Dark Chocolate. 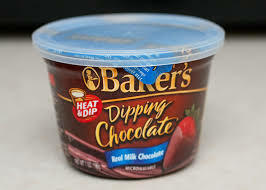 This container works great with left over chocolate, just pop on the plastic lid and refrigerate until you make these again. The chocolate won't stay in the fridge long because you'll make these often! Line a baking sheet with parchment paper, wax paper or a Silpat (non stick baking mat). Peel and segment clementines, set aside. Be careful not to break the skin as the juice will seize the chocolate. Gently melt chocolate in the microwave. Dip segments in chocolate and transfer to parchment-lined sheet. Once all pieces have been dipped, set the sheet aside until chocolate hardens (takes about an hour). To quickly harden chocolate, transfer baking sheet to the refrigerator for 10 minutes. Serve at room temperature. *You can use milk chocolate if you prefer.